One of the most recognizable houses on Soundview Drive has met its end. 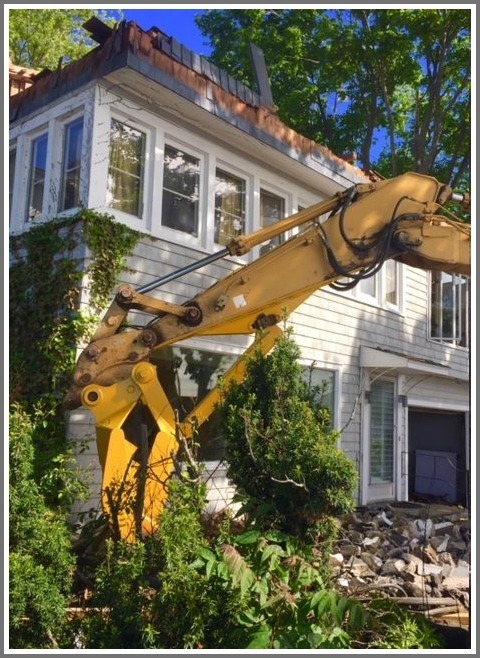 The longtime home of Toni Cunningham — for decades a moving force behind the Compo Beach Improvement Association — was demolished today. Its other claim to fame: It was the only house with a driveway actually on Soundview Drive. Every other home on the beach exit road is accessed by a side street. This entry was posted in Beach, Real estate and tagged Soundview Drive, Toni Cunningham. Bookmark the permalink. Knew that house well we lived @ 39 Soundview drive at corner of soundview across from jetty.Limperts for over 75 years on compo beach. Only peripherally about this post … does anyone remember Mrs. Gerard on Soundview? Her house was the quasi Dutch colonial 2 doors in from Compo Beach Rd. In the early 1960s she had a collie with one blue eye. And she had a rooster or a hen in the large front garden. Anyone? I remember the house and family well. Another loss to Westport’s history and character. Sad to see this tear down. Wondering why it’s being torn down. Maybe too much salt/sea/flooding damage over the years? Wonder what will be built in its place. Frankly, I would run for the hills vs. buying and/or rebuilding on a low lying coastal property, like Saugatuck Shores. Even if I had the bankroll to do it, it seems precarious at best. It’s not a “sound” investment (ahem, accidental pun) IMO. It’s more than likely, much sooner than later, that the ground level living space will become a mold infested swamp (no political reference intended … although, it does kindof “flow” with the current crisis we are witnessing, heh heh). Of course, the FEMA reco’s are to build “up”, post hurricane Sandy. Maybe that will help to delay the effects of the … inevitable? Thanks for the post, Dan. It’s cool to see what’s happening around town, and I hope my somewhat cynical mood today doesn’t detract from my appreciation for these tidbits! Up until now I didn’t really care. But this teardown really ticks me off. Was the WHC on vacation, medical marijuana or preoccupied with Stormy Daniels? Toni once told me the reason her house was the only one with driveway access to Soundview Av was that a pediatrician lived in the house before her and he needed to get out fast to his patients! Viveka: Interesting historic note. Thank you for sharing. I went to school with Gail C.C., K-12, and last spoke with her at her Soundview Ave. home, when she hosted an after-reunion gathering for some of her Staples HS classmates.